Home Games Review A revelation about Icefrog Identity- icefrog conspired with VALVE? 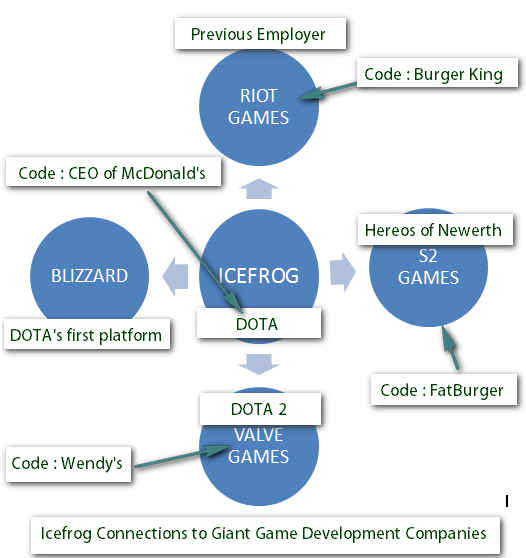 A revelation about Icefrog Identity- icefrog conspired with VALVE? According to the author the real name of Icefrog was Abdul Ishmael, an Arab and he added also that Icefrog was a liar and hard to work with person. Is this true? On the middle of his confession the guy pointed out some important information connecting Icefrog to several game developing companies. According to him, Icefrog first work to Riot games (Burger King), then quit transferred to S2 games (Fatburger) and now Icefrog join with Valve games(Wendy) to produced DOTA2. So what’s the issue about it? For me you just can simply think that valve conspired with Icefrog works that he was stealing some trade secrets from different companies. I don't know what's the motive of this anonymous guy who speak against icefrog.Jealous?lol.. In my own view ,I wonder before how S2 Games quickly produced the DOTA replica, "Hereos of Newerth". Interesting right? Does Icefrog give the game copy to S2 Games or He was one of the HON team working to it. Well, you cannot blame Icefrog if he wants to monetize his invention because making a good game such DOTA requires much skills and resources. Remember, Icefrog is not getting revenue from the Maps he created for DOTA while running in Warcraft due to Blizzard TOS. If you could observe Icefrog introduce some different platforms that DOTA could run to start fleeing from World of War Craft. Icefrog Dota 2 project will run on Valve not in Blizzard. Does Blizzard TOS could stop Icefrog to monetize his maps since he is now at VALVE? I don’t know. If I am Icefrog maybe I’ll do same thing to support my living and that’s we call game but I wouldn’t act as hostile to my co-team. Look now somebody named him (Icefrog) a terrorist. I have emailed Icefrog to ask if all this accusation is true but no response.